An amusing and delightful miniature concerning the Scottish island of Colonsay, seventeen square miles of dews and damp twenty-five miles off the coast. Mr. McPhee and his family, descendants after many misty generations, of a clan which had been overcome by a pack of MacDonalds on Colonsay, visited on the island and became acquainted with the 138 people living serenely thereon. 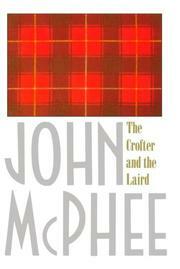 Prime movers or rather immutables in his microcosmic study of this continent of souls are McPhee's model inhabitants: Donald McNeill, the "crofter," and the "laird," Euan Howard, fourth Baron Strathcona, who like Mr. McNeill, is alternately bemused and irritated by the feudal barony. Yet both participate solemnly in the rituals of Rent Day ("'And how are you'? . . . you're looking fit. . .' 'Milord, I thought I might mention that I have a fence down and. . .'"). But the laird will admit to McPhee: "They are entitled to be a little sore when they are dragged screaming into the twentieth century, It's a dicey business for me!" History, myth, present economic and political incongruities, gossip and imposing personages, scenery and conviviality--it's a canny and handsome skirl. Original appearance in The New Yorker.